Posted on April 10, 2014 by Al B.
I’ve worked on this for the last couple of years. 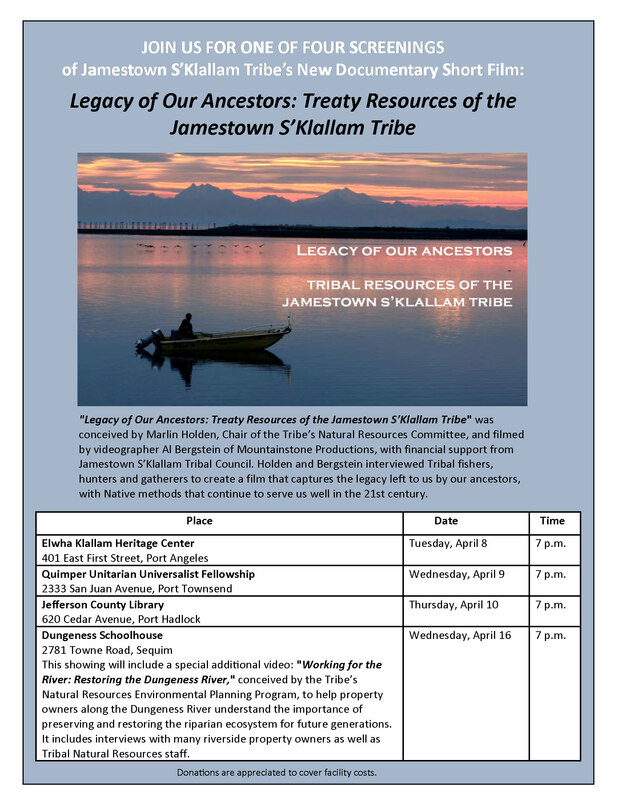 Now’s your chance to see it and learn more about this very important neighbor of us here on the Peninsula. Various dates over the next two weeks. All showings are free, donations are welcome to help offset costs. Tonight at Hadlock at the Jefferson County Library. Tribal Elder and Co-Creator Marlin Holden will be present to share his thoughts and answer questions. Would you be willing to come to Olympia on April 28th and have a screening of the Legacy video at Traditions at 7 pm? We have the space for that evening and have been wanting to show a film and have a public discussion about extinction of species or global warming or something along those lines. I think it might be fun to see a new release and knit our communities together a little more strongly. Can’t make that week. Let’s discuss other dates.